﻿A slim captain dressed in a short green coat slipped through the forest. He looked quickly left and right, visually checking that his corps was in position. They had an important task: spearheading the advance of General Knyphausen across the Brandywine River. Captain Patrick Ferguson concealed himself in the brush and checked that his weapon was ready for action. This was no ordinary musket, but a highly-sophisticated breech-loading rifle. Ferguson held a patent for it and had even demonstrated it before King George III. The British realized the importance of Ferguson’s rifle, and ordered him to form a unit of riflemen to aid them in their war against the American rebels. 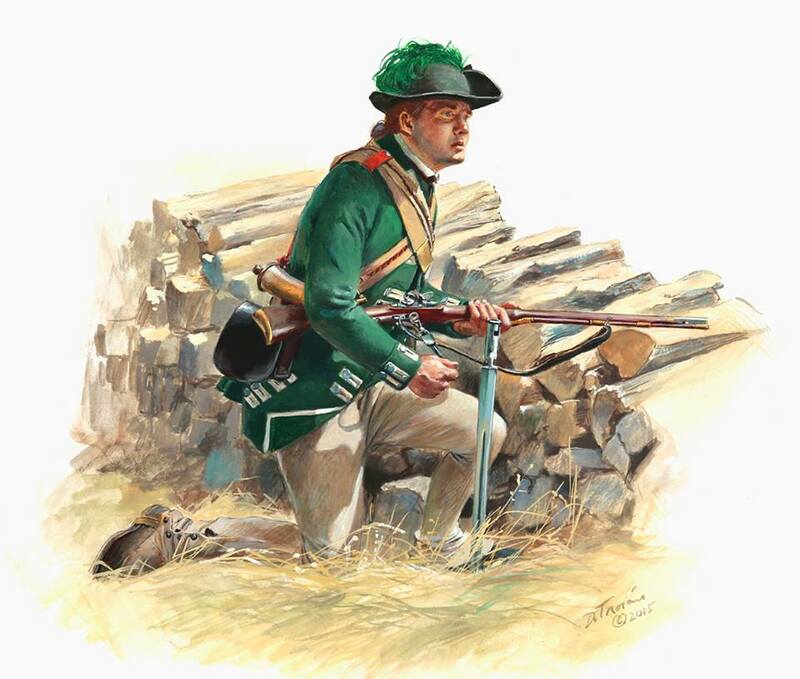 100 men were put into Ferguson’s Riflemen, and since their guns could fire 6 shots a minute, they were a formidable asset to General Knyphausen’s column. As Ferguson watched the countryside, he noticed two riders come slowly toward his ambush. One was unusually dressed in a hussar uniform, while the other rode a bay horse and wore a large cocked hat. Ferguson ordered three of the best shots in his corps to come and shoot down these officers, but countermanded the order. To deliberately target officers like this was not civilized warfare. The hussar made a circuit away from Ferguson, but the other came within range. Slipping out of the brush, Ferguson called, ordering him to stop. The rider looked back and slowly continued on his way, heedless of Ferguson’s deadly rifle. Again Ferguson motioned for him to halt, but the rider’s back was turned and he kept on. What an opportunity! Patrick Ferguson, one of the best marksmen in the British army, could have shot this rider, who was obviously a general officer, in the back. Yet as he fingered the trigger, a thought flashed through his mind. It is not pleasant to shoot an unoffending individual in the back, he mused, especially while this individual is only attempting to do his duty. Ferguson lowered his rifle and the man rode away. Minutes later, a musket ball slammed into Ferguson’s right elbow. He was helped to the field hospital, where the bullet was extracted. As he was recovering, he told this story to other wounded British officers. One of the surgeons, who had been attending the wounded Americans, heard it. He informed Ferguson that the officer he had earlier refused to shoot was none other than the rebel commander-in-chief, General George Washington. God’s hand of Providence had clearly kept George Washington safe at this battle of Brandywine. 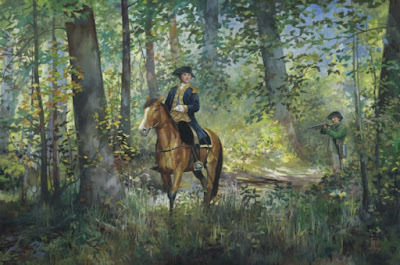 "Washington's Encounter Along the Brandywine"
Painting by Pamela Patrick White. "We had not lain long...when a rebel officer, remarkable by a hussar dress, passed towards our army within a hundred yards of my right flank, not perceiving us. He was followed by another, dressed in dark green or blue, mounted on a bay horse, with a remarkably large cocked hat. I ordered three good shots to steal near...and fire at them, but the idea disgusted me. I recalled the order. The hussar in returning made a circuit, but the other passed again within a hundred yards of us, upon which I advanced from the woods towards him. On my calling, he stopped, but after looking at me, proceeded. I again drew his attention and made signs to stop but he slowly continued his way. As I was within that distance at which in the quickest firing I could have lodged half-a-dozen of balls in or about him before he was out of my reach, I had only to determine. But it was not pleasant to fire at the back of an unoffending individual, who was acquitting himself very coolly of his duty, so I let him alone. The day after, I had been telling this story to some wounded officers who lay in the same room with me, when one of our surgeons, who had been dressing the wounded rebel officers, came in and told us they had been informing him that General Washington was all the morning with the light troops and only attended by a French Officer in a hussar dress, he himself dressed and mounted in every point as above described. I am not sorry that I did not know at the time who it was." I vaguely remember hearing this story years ago. Fascinating to learn the details!